Beautiful set of 6 prints based on antique Japanese Woodblock botanical illustrations from 1917. Wonderful details, colors and natural history feel. 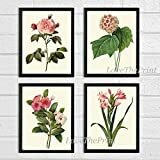 Beautiful set of 4 prints based on antique botanical illustrations from 1887. Wonderful details, colors and natural history feel. • The prints measure 4×6, 5×7, 8×10, or 11×14 inch. based on your selection and come with a white border for easy framing. • The prints will be carefully packaged in a clear bio-degradable protective sleeve and shipped with backing to insure safe delivery.